This has been Papa's favorite saying every time my sister and I are down with a nasty cold or we would need to take a day off from school because of a bad tummy ache. He would shake his head and give us a stern look just so we won't see how worried he really was about our sick condition. Oh I totally dislike going to the hospital..the smell of sanitizers makes me nauseous and needles and blood give me the creep. 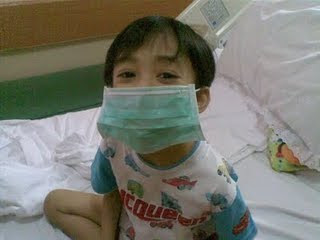 Friends, a little boy named Mio was diagnosed with Acute Lymphocytic Leukemia . It's a really nasty type of cancer that spreads rapidly, attacking this 5-year old boy's body f-a-s-t.
His mom, Jasmine, is a former colleague of mine. Though we were just introduced once, I would like to dedicate this entry to call out to everyone who can help. If you'd like to confirm the receipt of your donation, kindly get in touch directly with Cha Espinar @ +639178045453. OK! EIC Frances Sales is selling some beauty items to help raise funds for Mio. Click here to check out her online store. Let us pray that little Mio will soon get well. mio will be in my prayers, as my good friend's son who's turning 3, also has ALL. Please share this blog site to your friend and hope this can provide inspiration, support and more detailed information on the different procedures and medications they are providing in the US for their boy.